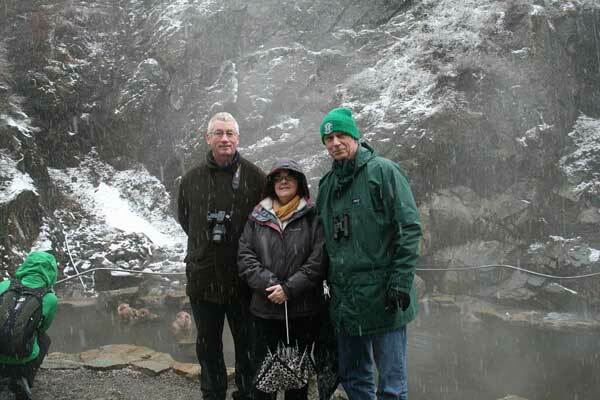 Frans de Waal, Linda Marchant and Bill McGrew at Jigokudani, 25 March 2010. Photograph by Yoku Hattori. We spent the period of 18 March to 11 April 2010 in Japan, as part of a delegation of 6 scholars from the University of Cambridge. (During this period, Prof. Marchant was on sabbatical leave from Miami, temporarily based in Cambridge.) We joined 2 other senior researchers and 2 other junior researchers from outside Japan as part of the HOPE-GM project, with special reference to the International Training Opportunities for Young Researchers. We were pleased to make use of the newly-opened facilities of the Centre for International Collaboration of Advanced Studies in Primatology (CICASP). We sought to engage with our Japanese counterparts, as well as one another, to share perspectives and knowledge of primatology. This exchange was based on a wide range of experiences gained from behavioural, cognitive and ecological study of non-human primates, especially great apes, in both natural and captive settings. 22-23 March: HOPE-GM conference on 'Primate Mind and Behavior'. Gave invited lecture on 'Fifty Years of Wild Chimpanzee Tool Use: Where Do We Stand?' Kyoto University Clock Tower Centennial Hall. 24-26 March: We joined Prof. Frans de Waal and Dr. Yuko Hattori for a visit to Shiga Heights, to see the wild Japanese macaques ('snow monkeys') of Jigokudani. This was wonderfully successful, as we were able to make observations and take photographs of the monkeys in the hot springs during a period of falling snow. It was exquisite. 29 March-2 April: A group of both senior and junior foreign scholars, assisted by Mr. Yoshiaki Sato and Fumiharo Kano, visited the island field sites of Koshima and Yakushima. At Koshima, we were fortunate to see the monkey doing their famous sweet-potato-washing and grain-sluicing in the water at the beach. At Yakushima, we saw the completely wild (never provisioned) monkeys in the forest of the national park, sometimes accompanied by wild deer. At Yakushima, as well as seeing the magnificent ancient cedar trees, we stayed in an excellent seaside ryokan, with delicious traditional Japanese cuisine. 3 April: We participated in a one-day conference on the theme of the intersection of comparative cognitive scienceand field science, in Nagoya. I gave a lecture entitled 'Spontaneous Ingestion of Alcohol by Non-human Primates: Seven Hypotheses and Some Preliminary Findings', co-authored with Kimberley Hockings and Tetsuro Matsuzawa. 9 April: We toured the Japan Monkey Centre, with its director, Prof. Toshisada Nishida, and a colleague, Mr. Gaku Ohashi. Other events: We were lucky to experience a number of scientifically and culturally enriching activities during other days, including: Demonstration of research on complex cognitive functioning by Ai and her companions, guided by Dr. Masaki Tomonaga; an evening of traditional Japanese music and dance, followed by a sumptuous meal, in Gion, Kyoto, hosted by Prof. Matsuzawa and Dr. Gen Idani; walking tours of Inuyama, to see castle, temples and shrines, during the cherry blossom festival. During the few days that we were not busy, as above, WCM worked to complete the manuscript of a forthcoming book, Chimpanzee Behavior in the Wild: An Audio-Visual Encyclopedia (Tokyo, Springer, 2010). This is co-authored with Prof. Nishida and three other Japanese primatologists. We are exceedingly grateful for all the generosity and hospitality that we experienced during our visit to Japan. We thank all of our Japanese colleagues (too many to be named individually) for making it a visit to remember for the rest of our lives.